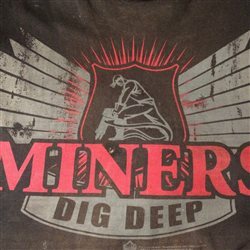 Thank you very much, Miningman and Mike! Love this Pennsy advertisement. The content of the text sounds like "we" passenger owed PRR some favor! The tone is like a complaint letter to the society more than something trying to convince the passenger to abandon their new fancy cars and jump back to their "cheaper" train. Interesting. "YOU PAY MUCH LESS FOR IT, FOR US IT COST MORE" I feel like a Pennsy official pointed his finger to my head, trying to teach me a life lesson...blah blah blah... Ok, Mr. Pennsy, YOU go figure it out how to run your business and keep your trains clean, WE will keep driving my custom fancy town car and travel on the new highway and the sky (because our kids wanted to)! By the way Mr. Pennsy, YOU must not forget that WE still have other choices like B&O and NYC if WE want to travel by train! Definitely a bit condescending. The last sentence is weird... are they begging?, warning? Throwing a fit? Looking for Government assistance?Alms for the poor? .. more of a threat really, ... 'better be nice to us or we will take our trains and go home and then what are you going to do'. T1 Duplex in ad with the Buick portholes up front. We built these beautiful fast locomotives just for you and now you don't come. Our engine crews hate them and they really don't work that great but dammit you better show up . The thought that crossed my mind was "Well OK, raise the passenger rate to $2.50 per mile and make it up in volume!" But then, that's me thinking like a retailer. I did learn a bit working in a gunshop for nearly a decade. The ad looks like just a little bit of PRR arrogance is seeping out. Nothing was ever their fault. There's a fella on a big Toronto radio station that does a 3 minute stock market update after newscasts and he is always always ragging on the transit TTC and Go Train subsidies and has forever demanded people pay their own way and the subsidies end. With current volumes 2 bucks a ticket will do it but he is a voice in the wilderness. Been harping on it for years though. Could it have just been a warning that they would start asking for discontinuances due to losses? The very day the ad ran the eastern railroads asked the ICC to raise fares, which it did. A temporary increase of 10 percent in basic fares was authorized by us in 1942, resulting in maximum fares of 2.2 cents per mile in coaches and 3.3 cents per mile in parlor and sleeping cars. Upon request of the railroads this increase was continued without expiration date by our report and order of December 5, 1946, in Increased Railway Rates, Fares, and Charges, 1946, 266 I. C. C. 537. Prior to 1942 railroad passenger service was generally operated at a deficit, but during the war years, 1942–1945, substantial earnings were derived therefrom, primarily because of the large and unprecedented volume of passenger transportation incident to the war. Since the close of hostilities, travel has substantially declined although it is still greater than in any previous peacetime period. This decline, coupled with rapidly increasing operating expenses and taxes, has again produced a revenue deficit from the railroad passenger service. Your respond really made me laugh, Miningman. So true. If it was a warning of Pennsy for a forthcoming fare increase or an attempt to arouse the masses for political pressure, I am really not impressed. 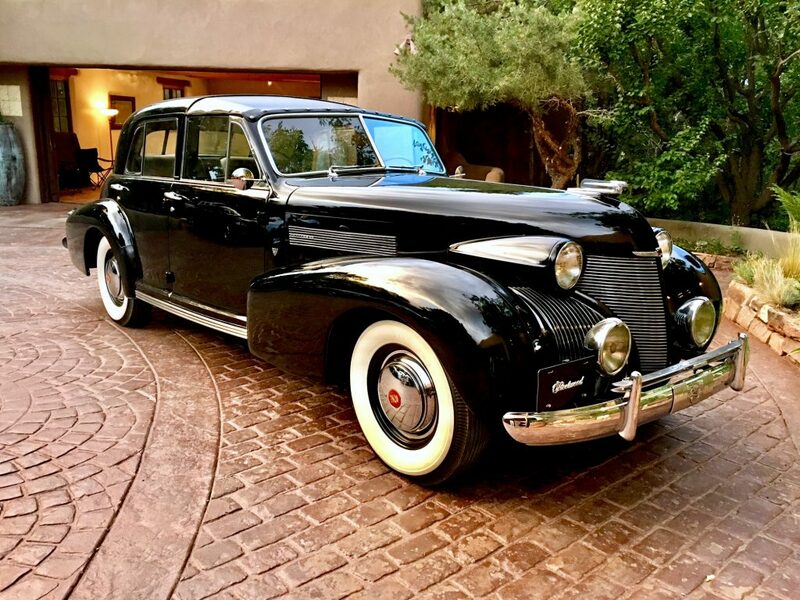 By the way, the design of T1 in the advertisement was not what the management wanted, all Buick portholes were removed by 1948, the same year Raymond Loewy's Office ended his business cooperation with the PRR. As a Pennsy Fan, It is hard to not agree with this point. Well I will take a different tack from all of you PRR haters. If the numbers are accurate $2.24 cents operating cost divided by 2.2 cents per mile means the railroad has to carry 81 passengers per mile to break even and that does not include making a profit. War time efforts severely degraded nearly everything about all railroads. the public was demanding new streamlined equipment. Airlines and cars were coming into their own. No wonder the railroads wanted out of carrying people. It wasn't just the PRR that faced these problems. All railroads did. There is no antidote to travelling when you want and where you want to go that public transportation can compete against. The car will remain the best alternative over public transportation. Train travel would die and cost the railroads a fortune to maintain. Hence Amtrak that without the subsidies would die in a heartbeat. Why take the train when air travel is faster and in most cases cheaper and the ultimate in convenience is your car since it is door to door? Unfortunately railroads are obsolete for the most part. Time sensitive shipping is done by air or UPS. Railroads replaced horses and wagons and canal boats. Planes and trucks replaced trains. Change is inevitable and passengers are fickle. Ask the airlines. Whoa! Hold on there! I wouldn't say there's any Pennsy haters here, far from it. I mean, HOW could anyone hate an organization that came up with such classic machines as the K-4, and those oh-so-cool GG1's, T1's, and the spectacular (even though one-of-a-kind) S1? The thing is, even though you can admire an organization, or a person for that matter, it doesn't mean you're blind to their faults. That's when you cross the line from admiration to idolatry. The PRR was great, but it wasn't perfect. No-one is. Except for maybe the Erie and the Jersey Central. Half of my Top 10 favorite steam engines were built by Pennsy, but this doesn't mean that I should accept everything they did without any question. What was the car behind the tender? My first glance said it was a Cambridge Tunnel car from Boston, but those were built in 1912 and had a lower profile... It's probably a horse express car. The big fishbelly frame stumps me a bit, but such cars were common, used to transport racehorses and sometimes stage scenery. Don't think it's a PRR car, but that's as far as I get. The T1 in the pic I posted was probably hauling The Manhattan Limited; it usually carried considerable head-end equipment. Glad you found that since I couldn't find a matching photo. I was leaning to Santa Fe due to the fishbelly underframe. Note the end doors, specifically for loading stage scenery. That's how Broadway shows went on the road, though on the Manhattan Ltd., not the Broadway! Without your hints, I probably would have given up searching! You mentioned stage scenery and accessories were loaded on the car and it was not a PRR horse express car, which made me think about the railroad who was "Pennsy friendly" and cooperated with PRR on transcontinental trains connected the Hollywood and Chicago, so I picked Santa Fe and found it. A Broadway show on the broadway of PRR, that's interesting! The end door was perfectly large enough for loading stage set without damaging them, no wonder why this car was seen running behind the tender! I wonder what about horse car service and stage scenery service made them complementary uses for the same car. It seems most any baggage car with end doors could haul the scenery. 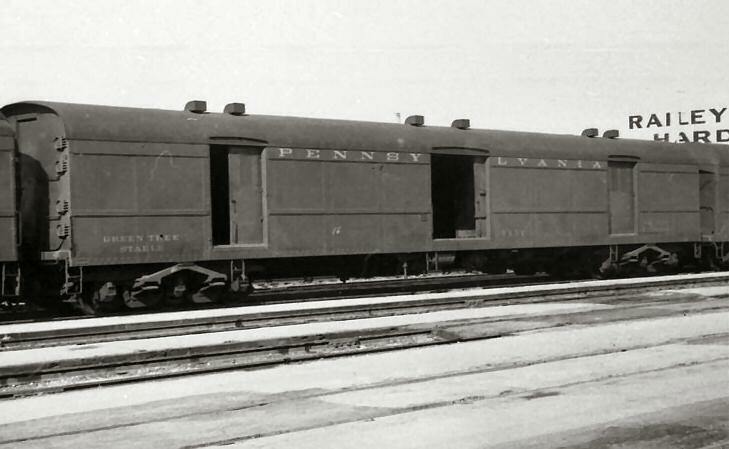 End-door baggage cars weren't all that common. The end doors on a scenery car go all the way to the top of the clerestory. The stalls used for horse service could be taken down, leaving behind lots of tie-down hooks for stabilizing the flats and other scenery pieces. The cars were heated since both horses and stage scenery were very valuable relative to most express shipments. The Santa Fe car looks like it's only equipped for horse service. PRR had dual-purpose cars, and NYC probably did as well. The end doors could also be used for horse loading if a "circus ramp" was available. I would think the horses had to be accompanied by humans (grooms, etc.) and it wouldn't surprise me if stage scenery tariffs allowed a "messenger" to go along, meaning that there's probably a toilet in there somewhere, too. Here's a PRR B70a scenery car NOT equipped for horses (though PRR had some that were). Note the high roof arch. Some of them were apparently named after characters in Shakespeare, this one is "Richard III". End doors on one end only. ...and here's a B74b horse-express-scenery car, assigned to Green Tree Stables. I think the end doors were only on one end. Walthers sold a model version of this car decades ago. Thank you so much for the pics, rcdrye. 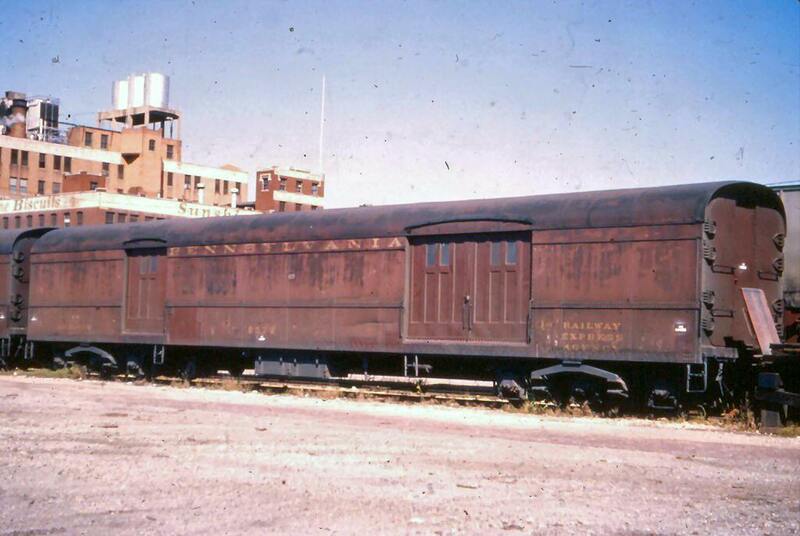 These were the train car that connected the Entertainment Industry with Railroad Industry. They were part of the history of American railroading. The automobiles (if any) would not have been shipped on the top trains. Loading and unloading the specialized cars would have taken too long in that era.